Flowers for the asking at the Essex May Market. ESSEX — The long-awaited May Market is almost here. Set your Calendars, i-Phone and Smart Phones to Saturday, May 12, from 9 a.m. to 2 p.m., rain or shine, in the town park, located on Main Street in Essex Village. Always the star of Essex May Market is the ever-popular Members Plants. 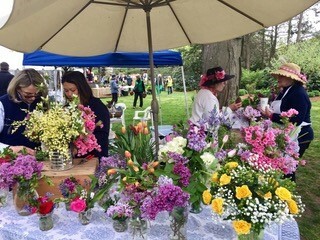 People have been coming to Essex on May Market day for years from all over New England to take advantage of the healthy plants dug and nurtured by the Garden Club members. 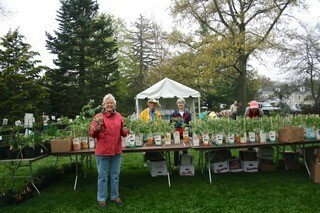 These plants include perennials, ground covers , grasses and shrubs dug and potted from the garden club members. An early sell-out in the Members’ Plants area each year are the many varieties of tomato plants grown from seed and cultivated carefully. There will be 300 tomato plants, including many heirloom varieties guaranteed to grow in our climate. There will also be a colorful assortment of annuals and hanging baskets for sale. Knowledgeable Garden Club members will be available to help with any questions on caring for the plants. Back by popular demand this year is the all-natural compost available for sale. The “Treasures” section is a great place to find gently used pieces of jewelry, garden pieces, planters, books. Children’s items, gardening tools and a mix of odds and ends. There will be lots of interesting finds for all ages. The Silent Auction will have an incredible array of goods and services donated from many generous merchants. Gift for Mother’s Day. Last year the fresh flowers were such in demand, we are going to have them again! In addition, we have also added a few new things … garden gifts, things that every gardener would love to have, or children could purchase as a Mother’s Day gift. Don’t forget to look for the Artist in the Park who will be painting scenes of May Market. 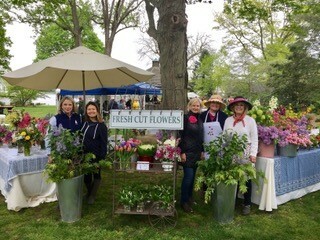 May Market is the Garden Club’s only annual fundraising event. Proceeds support civic improvement projects, such as beautifying town parks and traffic islands in Essex, Centerbrook and Ivoryton. Funds also provide scholarships for high school seniors and college students, summer camperships for young students, and educational programs for Essex Elementary school and John Winthrop Middle school. Funds also support adult and children’s programs in both Essex and Ivoryton Libraries. May Market is truly a gardeners dream. Come early, rain or shine, and for sure you will find something beautiful for your garden or a special gift to take home.